I've been a casual Sufjan listener. I can't recite his tracklist off by heart. I can recognize songs, and its hooks. And that's about as much Sufjan knowledge I have. To say the least I had no idea what to expect from the concert. The show began at 8:30 - the opener played 4 songs. It was a lovely 25 minute musical interlude of vocals, guitars, claps, and snaps all looped into a massive sound. I though it was a little disorienting and found myself thinking of hallucinogenic dances around camp fires.... I don't know where this association came from. To say the least, the audience really responded to this opener and clapped, cheered for him between songs. Just after 9:00 Sufjan Stevens came on stage. The applause was deafening. 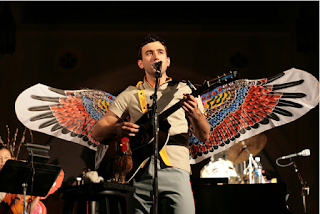 During the entire show brilliant projections of Sufjan , his dancers, animated shorts were shown on the backdrop. I really enjoyed the visuals, it added a different dimension to the show. The music was mixed perfectly, the 2 drumsets. 2 backup singers/dancer, 2 trombones, 1 pianist, 1 keys/sound effects man, 1 bass, 1 electric guitar and Sufjan and his multiple instruments all blended together, without one overpowering the other. His voice --- His VOICE was on point. In short, the show consisted of choreographed dance moves, impeccable vocals, projected visuals, great live band = one of the most visually and musically interesting shows I have ever been to. It was a pleasant surprise, for sure. Things to be Excited About.